You are at: Home / Agora / Greek debt: A case of learned helplessness? Learned helplessness also applies to situations involving human beings. Its effects can be seen in people. When they feel they have no control over their situation, people may also begin to behave in a helpless manner. This inaction can lead them to overlook opportunities for relief or change. Over the last year, the Greek public has been conditioned, even by leading figures in its own government, to believe that Greece’s debt is sustainable. There seems to be a concerted effort by decision makers to instill the expectation that nothing can be done to change the situation and no alternatives should be sought. A country that effectively went bust because its political class had accumulated a debt of 299.7 billion, a burden of 129 percent on an economy of 232.1 billion, is now expected to collectively believe that its debt is sustainable and it should not pursue any debt relief. 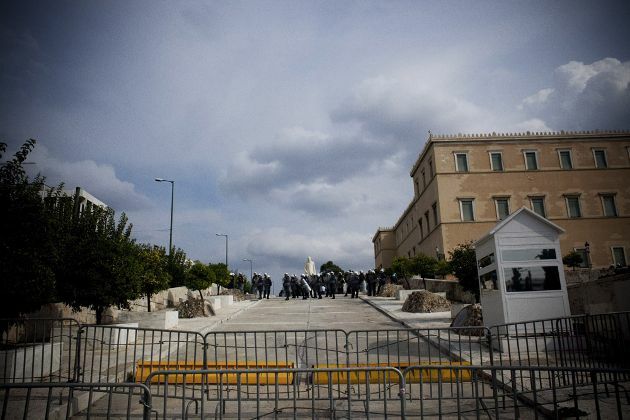 “Forget it Yiannis,” as Greece’s previous Finance Minister Yannis Stournaras admitted he was told by his German counterpart Wolfgang Schaeuble when he brought up the issue. It spoils the narrative to argue that Greece’s debt as of the end of last June stood at 322.4 billion euros - almost 23 billion euros higher than in 2009 – or over 170 percent of GDP given that roughly a quarter of the economy has evaporated over the last five years and economic activity will reach just 182 billion euros in 2014. In 2010 Greece was denied a debt restructuring by its eurozone partners although it was evident that one was necessary. Instead, Athens was offered a loan arrangement that would act as a temporary holding operation until an unprepared eurozone built a firewall around Greece to avoid contagion. Had the Greek crisis spread to other weak nations in the periphery, core eurozone banks would have taken a massive hit. Ten years of integration in the monetary union would have created the perfect storm in the vicious cycle between sovereigns and banks. Conveniently, Greece’s solvency crisis was presented as a liquidity one, prompting the eurozone and the IMF to put together a loan package of 110 billion euros for a period of three years. For a sense of scale, when the program was initially set up, out of the 87 billion euros scheduled to be disbursed between May 2010 and the end of 2011 - the period that Greece was expected to be fully locked out of markets – the eurozone and the IMF had no issue with laying a path as wide as 37.5 billion euros so existing private creditors, mostly French and German banks, got paid in full and escaped from Greece scot-free. Another 10 billion euros were earmarked should Greece’s banks need any capital injections - although only 1.5 billion was drawn during the first program - and 21 billion euros to cover the public deficit including interest payments. Over the program’s three-year period Greece was expected to pay back 88.3 billion euros of long-term debt via troika financing and a gradual return to markets. Even if the troika had taken the most conservative approach and allowed re-profiling of debt maturities and lowering of interest payments of the same volume during the programme’s life, Greece would now be looking at a completely different debt pile and profile. By way of comparison, when the eurozone realised Greece would need more financing without market access and considered it was safer by that time for the private sector to be bailed in, the new bonds that were offered for exchange in the PSI had a 30-year maturity period, no principal repayment before the 11th year and a coupon of just 2 percent in interest payments to 2015 and 3 percent to 2020. The eurozone instead chose punishing, or “non-concessionary,” interest rates at the start of the program. It charged Euribor plus 300 basis points and then added another 50 basis points as a handling fee. This just exacerbated the debt dynamics. The rates that were so punishing they pushed the budget’s interest payments to 15 billion euros in 2011, from 11.9 billion euros in 2009, before Greece lost market access. In 2009 interest payments represented 5.2 percent of GDP but in 2011 they shot up to 7.2 percent. Greece has a further grievance in that the ECB offered private creditors who owned Greek bonds an additional path of escape via the SMP program, which exceeded 50 billion euros of the country’s debt that was deemed senior and was excluded from the PSI. Even the arrangement to return to Greece the profits that eurozone central banks made from their Greek bond holdings is opposed by some within the eurozone who trot out the tired argument that this process is monetary financing. Greece’s arguments for meaningful debt relief extend to the almost 50 billion euros it was obliged to borrow to keep its banking system afloat. The magnitude of the figure does not only relate to the PSI. The collateral damage of the austerity imposed on Greece was the destruction of Greek banks’ balance sheets, with 22 billion euros of the estimated capital needs resulting from the deterioration of the loan portfolio. When the troika came to Greece it described a resilient banking system with good capital adequacy and non-performing loans of just 8 percent. Since then, though, the economy has fallen off the cliff, unemployment has shot up to 28 percent, household’s budgets have been destroyed through internal devaluation and businesses’ plans through severe loss of revenue. As a result, one in three loans are now in the red and despite a heavy round of state aid and a recent recapitalisation from the private sector, Greek banks still face uncertainty. Their balance sheets were not done any favours by the deposit flight instigated by the repeated statements of European officials in 2011 and 2012 that either insinuated or outright threatened a euro exit for Greece. It is not an unlucky coincidence that even though Greece cut 138 billion euros of debt -106 billion through the PSI at the start of 2012 and another 32 billion through a debt repurchase in December 2012 – it will close this year with more debt than when this miserable experience started. The Bank of Greece estimates that the true reduction on a net basis did not exceed 51.2 billion euros. This is a product of the eurozone denying a decisive solution from the start and never having a genuine intention of resolving the issue that was at the epicentre of Greece’s crisis: The debt. Core eurozone governments did not want to find themselves on the hook for bank bailouts in their countries, the ECB vehemently opposed any debt restructuring up to the last minute and in April 2011 went as far as threatening to cut off Greek banks from its financing operations had Greece decided to pursue a debt rescheduling. The IMF never strongly argued the case within the awkward and politically confines of the troika. The aversion of eurozone politicians and officials to deal with Greece’s debt is so strong that they do not have any reservations about blatantly backtracking on their pledge to discuss further debt relief measures once Greece achieves a primary surplus. They have pushed the matter from the end of 2013, to until after Eurostat confirmed the surplus in April this year, then after the European Parliament elections, to after the summer and not before the conclusion of the upcoming review. We have gone through almost an entire year of embarrassing excuses to avoid a discussion on this issue even though when it does finally happen it will be in a contained environment, focusing only on the eurozone’s preferred terms of loan extensions and some further interest rate reductions. There is a lot to debate about the pace, the intensity and the mix of austerity but the necessity to restore Greece’s finances back in 2010 is beyond any doubt and without the eurozone and IMF loans a default would have been severe. At the same time, justifying certain aspects of the Greek bailout only by pointing to the severity of the alternative of an outright default is an indication that those refusing to discuss true debt relief have run out of meaningful arguments. The German finance minister certainly does not want to go to his Parliament and explain that much of the Germany's share of the Greek loans was so Hypo Real Estate could reduce its exposure to Greece, an exposure which according to a recent article in the German press was as much as all the other German banks combined. For how long are we going to ignore that Greece was coerced into becoming the conduit for a quasi core eurozone bank bailout? If the country is to have a genuine shot at recovering from the deepest depression in history, it cannot be left to achieve that with a debt of such a magnitude, while being expected to generate an annual primary surplus of 8 billion euros to cover debt repayments for more than a decade. It is economically irresponsible and nationally damaging to sell country assets at knocked down prices via fire sale processes that have been questioned by the courts. It is socially damaging not to be given the opportunity to redirect budget resources and allocate any spare fiscal capacity to restore social welfare, the safety net for the most vulnerable and more targeted public investment that will generate much needed growth and jobs. When the European Commission called via a report in July for 450 billion euros to be invested over the next six years in human capital, employment, and expansion of the economy’s technology and knowledge base, Greece cannot leave its own human capital to wallow in long-term unemployment or see its talented young people leave the country. The government now seems to be abandoning its strategy of seeking debt relief in favour of securing the swift departure of the troika; a combination of institutions that were put together to deal with an emergency debt crisis and will be leaving Greece with more debt, a broken economy, 27 percent unemployment, wages down by 24 percent, disposable income reduced by a quarter, household expenditure shrunk by 27 percent and 34.6 percent of the population at risk of poverty and social exclusion. This is not just a fiscal adjustment program that went wrong, this is economic and social devastation that we cannot allow to be passed of as a success. After the price it has paid over the last few years, we should not permit Greek society to slip into learned helplessness on the debt issue. Really, a blog can't get a much better compliment than the one by Elisabeth below. A compliment to which I would like to add my name. To put it another way. This article below implies that Greece pays less than 1% on the majority of the 2 rescue packages. The market assumes that Greece is paying roughly 2% based on a annual debt service of 7+ Bil. euros on a total sovereign debt of 350 Bil. euros. Which is the true combined rate that Greece pays? Could you please remind us of the sovereign debt breakdown? What is owed to whom at at what rate? I have to echo Elizabeth's comments. A great analysis, well-written and well-argued, but your pricing plans is, to put it bluntly, unrealistic. Like Elizabeth, I understand and accept that you need to get paid for your work, but €50/month (€30 on an annual plan) subscription fee is certainly unrealistic for a domestic audience when many people are struggling to put food on the table. So that's leaves those in Greece who can afford these rates (once again we see the divide between the haves and the have-nots in that poor country) and those living outside of Greece who are interested in paying them. For my part, I would rather continue to send that amount to my family back home for them to live on rather than spend it on accessing protected content. It's a personal choice. Having said that, I wish you well and I hope you can continue to produce quality articles for all audiences - not just those who can afford it. Thank you for your comment. As you will see in my response to Elizabeth's comment, access to The Agora will remain free and we will explore what other options we can offer to readers. Another very well written and very balanced article. .I really appreciate Macropolis' exellent, well written and truly balanced coverage of Greece - especially that of N Malkoutzis and Y Mouzakis. I am in the mid-west of the United States, and the reporting on Greece here does not even slightly resemble reality, even on the National Public Radio. I think that I can make these comments with some degree of legitimacy as I have a close Greek friend with whom I have stayed (in Crete) for a total of 7+ months over the past 3 years. This was not the life of a tourist, and I have seen and heard a lot. What I have read here fits very well with what I have seen, and what has been explained to me by well informed thoughtful and fair minded Greeks who are not trying to defend any political party. Thank you. In such troubled times it is so important be so clear and tell the truth instead of trying to defend any side or party. Thanks for your comment. We really appreciate it. We understand that the subscription packages might not be for everyone. The combination of unique news and statistical analysis we offer involves a great deal of high quality work and has to be priced accordingly. At the same time, however, we do not want to lose touch with the readers we have gained in the 12+ months that he have offered our content without charge. That's why we are leaving access to The Agora free. Over the coming weeks, we will try to increase the amount of content that is published in The Agora, while maintaining the quality that you and others have come to respect. We will also take on board the comments made by our readers and try to find ways to best accommodate them as we move forward. I am happy to hear any further queries that you might have. Debt relief is often automatically translated into an outright haircut. That, however, is not the standard debt relief for a sovereign, particularly for sovereigns of the First World (as a an EU member, Greece counts as a sovereign of the First World). It was also the EU which did damage, in my opinion, by allowing discussions about straightforward haircuts from the start. That violated principle and precendent with sovereign debt issues and got everyone off to the wrong start. And the long-term consequences of violating principle and precedent cannot yet be judged, in my opinion. Prior to Greece, I cannot think of any country of the First World which ever received a straightforward haircut on its sovereign debt after only a few years of crisis and without any one-time destruction. Typically, such debts are reprofiled way out into the future (including interest payments) and interest rates are set way below market. That way, the budget is relieved for a long time to come and that, after all, is the point of debt relief. The other major violation of principle and precedent with sovereign debt was that Greece's debt was not reprofiled from the start but, instead, refinanced at par. The traditional approach in the history of sovereign debt is to 'delay and pretend' and to relieve the budget in the meantime. I still think that this would be the best approach for Greece. In practice, that would mean taking a large portion of the debt (say everything above the 60% Maastricht level) and replace it with a very long-term bullet-maturity bond (at minimum 50 years), with low interest rates and long grace periods for interest payments. Yes, on paper the debt sustainability would not look good but that is only on paper; not in terms of cash flow and what matters is cash flow. And there are various creative ways to structure such a bond (or bonds). The net present value of such (hidden) debt forgiveness can be very substantial!